A blue sky colour seen from the Pico del Teide at the Tenerife. When we ask ourselves why the sky is blue we can think about the most important type of light scattering in the Earth’s atmosphere. This is Rayleigh scattering. I was writing about this type of light scattering in some ocassions, like watching the solar eclipse through the webcams or wondering about the Martian sky. Today I would like to develop much more this topic and bring a rough answer for one of the most basic questions from geography or physics: why the sky is blue? 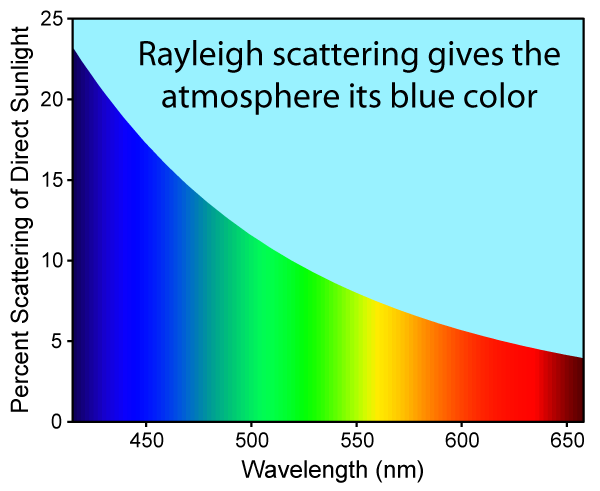 Rayleigh scattering is the scattering of light by particles much smaller than the wavelength of the radiation. Rayleigh scattering works the best in gaseous environment. The particles may be individual atoms or molecules. The intensity of scattered light significantly depends on the scattered light wavelength – increasing with the decrease of wavelength in the majority of cases. Sunlight reaches Earth’s atmosphere and is scattered in all directions by all gases and molecules in the air. 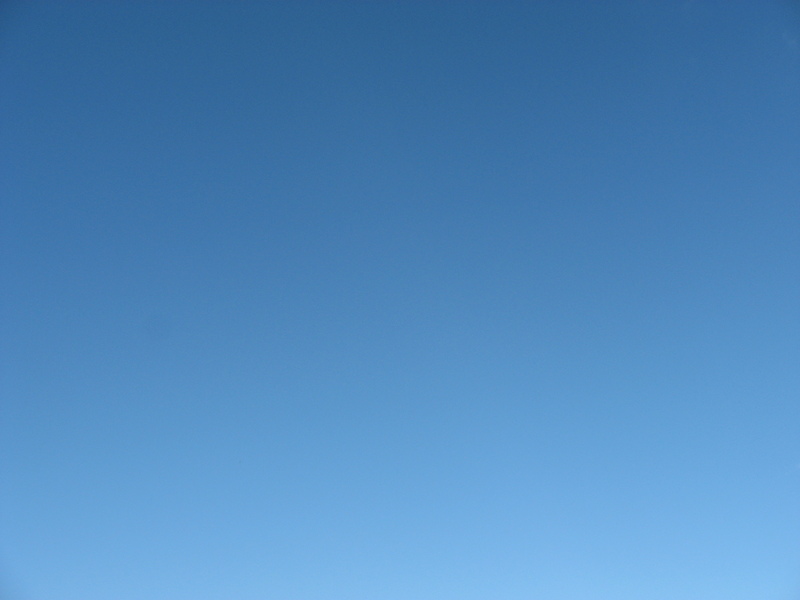 We see the blue sky for most of the time, because blue is scattered more strongly than other colours in the atmosphere. It happens, because Rayleigh scattering is inversely proportional to the fourth power of vawelength, so that shorter vawelength violet and blue light will scatter more than longer wavelengths (Pic. 2). Why doesn’t we seen the violet on the sky then? Violet basically is almost gone because of three factors: firstly Sun likewise other stars has its own spectrum of light emission, which is not constant and falls away in the violet. Secondly the shortes, violet wavelengths are absorbed by oxygen particles of the atmosphere. Thirdly human eye is less sensitive to violet. At the finish of this consideration I can add up the other factor, which is a presence other light wavelengths scattered in the atmosphere, that finally makes the output sky color like pale blue (a mixture of all the scattered colours, mainly green and blue)(Pic. 1). This output can be explained as an dominant wavelength, which for Rayleigh scattering is about 475nm, which lies solidly in the blue if we takes this to mean light with wavelengths between 450 and 490nm (Bohren, 2003). Conversely glancing towards the Sun directly the colours are not scattered away. The longer wavelengths such a red or yellow light are visible directly then, giving the Sun itself a slightly yellowish hue throughout the day and accordingly yellow, orange and red when near the horizon (Pic. 2, 8). Pic. 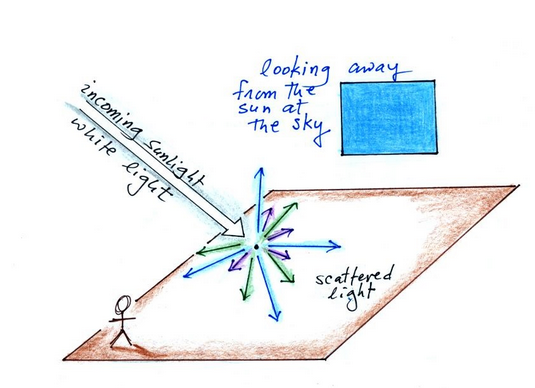 1 Basic mechanism of scattering the light on the molecules in the atmosphere. Incoming sunlight as a white light is next scattered mainly on blue wavelengths, with small presence of green and violet wavelengths (atmo.arizona.edu). Rayleigh scattering results the electric polarizability of the particles. The oscillating electric field of a light wave acts on the charges within the particle causing them to move at the same frequency. The particle therefore becomes a small radiating dipole, whose radiation we see as scattered light. Pic. 2 The visible wavelength scale against the scattering of direct direct sunlight (wikimedia.org). The Rayleigh scattering of sunlight in the atmosphere causes diffuse sky radiation. The diffuse sky radiation is solar radiation reaching the Earth’s surface after having been scattered from the direct solar beam by molecules or particulates in the atmosphere (Kondratyev, 1969). Pic. 2 The direct sunlight is scattered in the Earth’s atmosphere causing a diffuse sky radiation, what we can see during a typical sunny day. 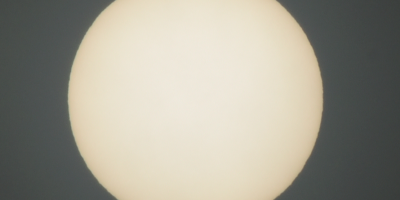 Sun appears to look bright whereas the sky is blue playing the role of medium, where direct solar beam is scattered and subsequently reaches the Earth’s surface. When Sun is overcasted by thick cloud layer and another part of the sky clear at once then we can experience how scattered solar beam reaches the Earth’s surface from the clear section of sky. Pic. 3 Typical color of the clear sky. Sky appears to be darker when closer to zenith. It is caused by Earth’s atmosphere thickness. Once we are looking up the atmosphere is the thiniest. As our sight goes down the thickness of the Earth’s atmosphere increases up to 38x times near the horizon. Hence lower parts of the sky are always much brighter than zenith sky. Skylight is not only pure blue. As per image above we can see a different blue hues across the vault of the sky. The best blues is at zenith (omitting the situation, when Sun is at zenith). Near the astronomical zenith the sky is brighter than overhead but of considerably lower purity (Bohren, 2003). The variation of sky brightness becomes better visible when observer is located higher above mean sea level (Pic. 4 – 7). This effect is best visible for us when flying at cruising altitude. 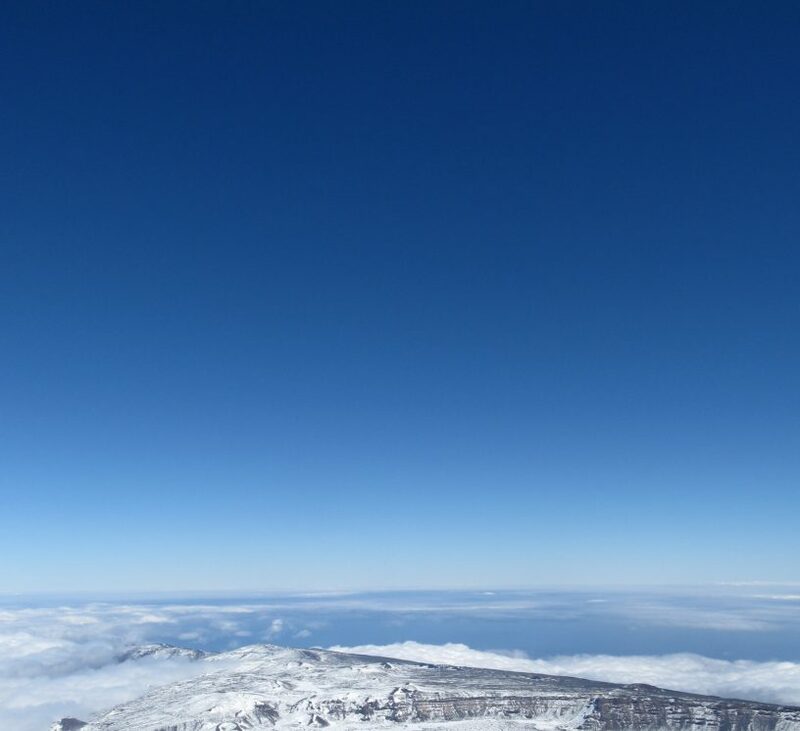 At 10000 m.a.s.l the sky is inherently the most nonuniform in colour for us comparing with view from the ground, especially from sea level in lower latitudes. To better understand this phenomenon we must invoke a multiple scattering, that plays here a major role. A solar beam being scattered in Earth’s atmosphere when entered to the medium has been scattered again on atmosphere molecules affected by earlier single scattered solar beam. It cause a multiple scattering, that tends to wash out the strong wavelength-dependence. That’s why during the bright day the blue color of the sky is much less saturated near the horizon than higher up. Pic. 4 Daylight sky seen from mean sea level. 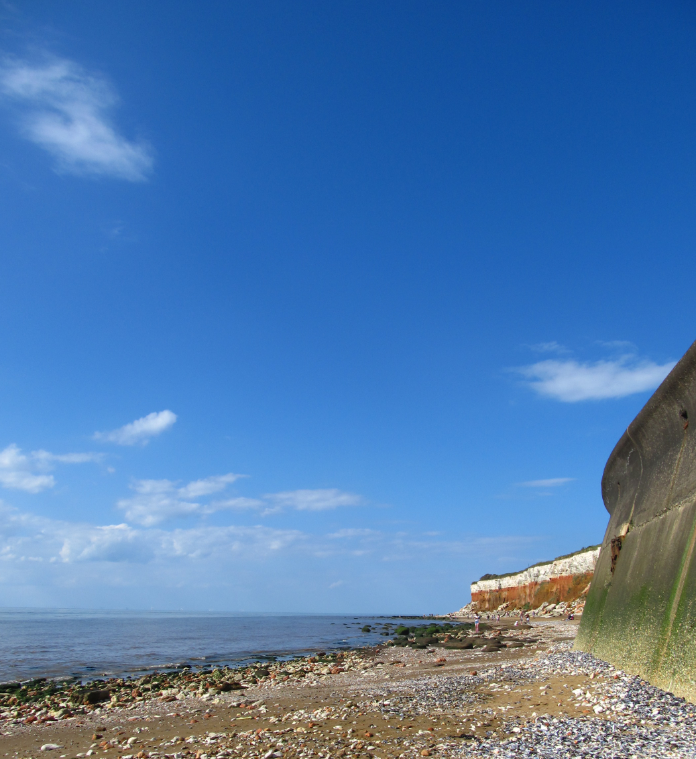 Hunstanton, United Kingdom. Pic. 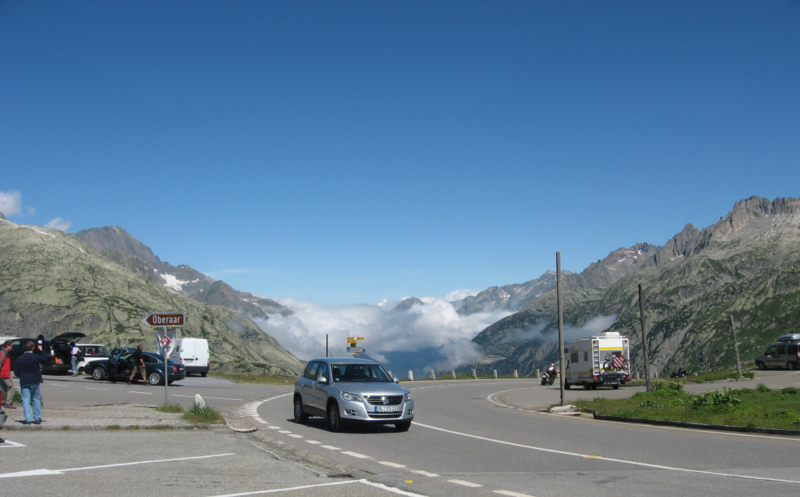 5 Daylight sky seen from Grimsel Pass, 2164 m.a.s.l. Bernese Alps, Switzerland. Pic. 6 Daylight sky seen from Pico del Teide 3718 m.a.s.l. Tenerife, Spain. Pic. 7 Daylight sky seen from the plane at the cruising altitude around 10000 m.a.s.l. LO 724 TBS – WAW. – altitude – comparing the sea level and aircraft cruising altitude there is a huge difference in atmosphere density. Basically at the upper troposphere we have around twice molecules less than at sea level. Because of this the sky appears much darker, that we used to see from the ground. This effect can be also noticeable in high mountains, when altitude is higher than 2000 m.a.s.l. (Pic. 5, 6). – latitude & climate – basically tropopause lies higher above lower latitudes. The colour sky variation will be slightly less noticeable on the equator than in polar areas. – waver vapour – will strongly influence on the sky colour variation, however in conjunction with the altitude will bring the same effect eventually. Basically in the “free atmosphere” it will affect sky colour variations marginally. I will bring more details in forthcoming articles. Looking on the sky through a polarizer, which preferentially blocks the polarization in one direction and allows the perpendicular direction to pass, one sees that light in the sky posseses some amount of polarizaton. This amount of polarization is dependant of the daily position of the Sun. While all scattered light is polarized to some extent, light is higly polarized at a scattering angle 90deg from the light source. This light source is mainly Sun, but also a Moon. The degree of polarizatio first increases with increasing distance from the light source, and then decreases away from the light source. 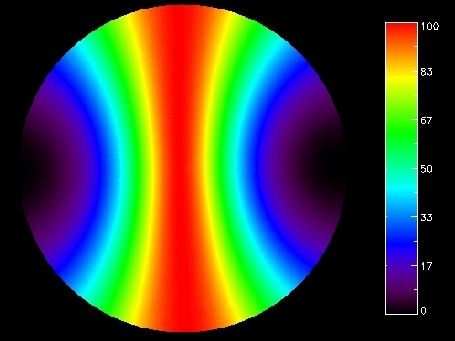 Thus the maximum degree of polarization occurs in a circular band 90deg from the light source. 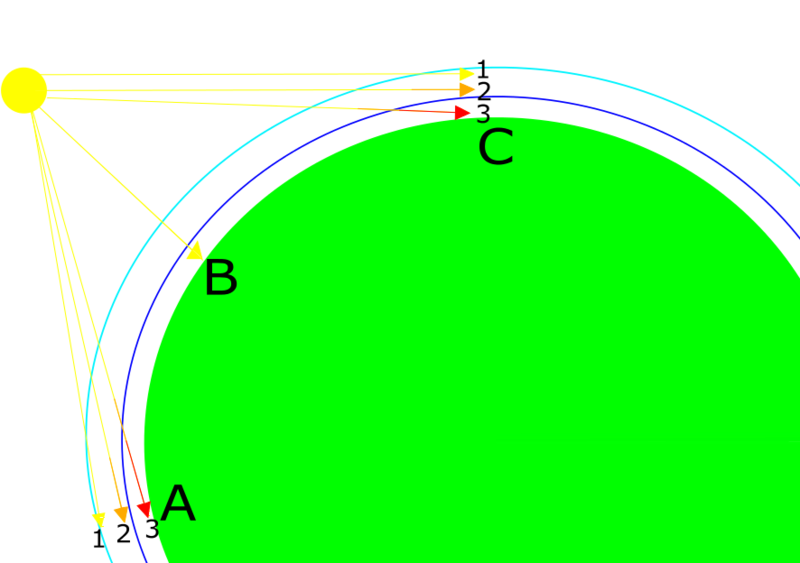 When the Sun is located at the zenith, the band of maximal polarization wraps around the horizon and light from the sky is polarized horizontally along the horizon. 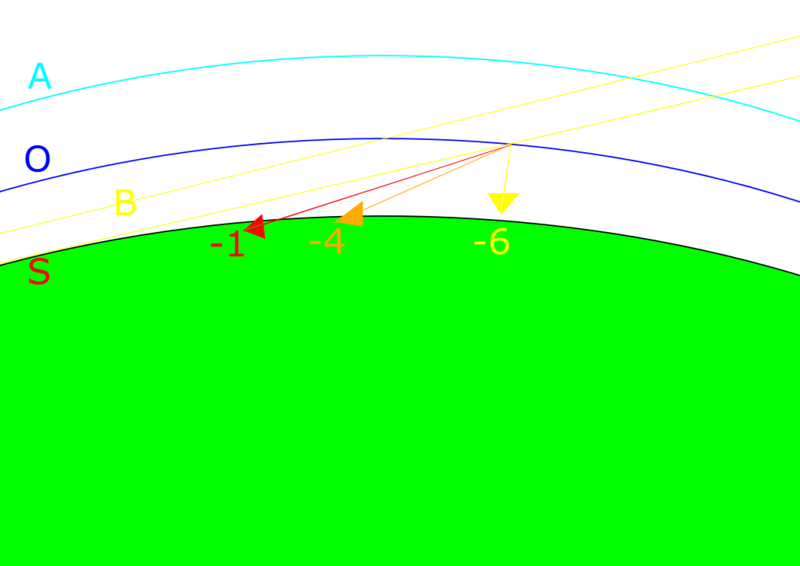 During twilight at either the vernal and autunm equinox the band of maximal polarization is defined by the north-zenith-south plane or meridian. In particular the polarization is vertical at the horizon in the north and south, where meridian meets the horizon (Pic. 8). Pic. 8 The sky polarization pattern at the sunrise or sunset, where the highest polarization occurs at the south-zenith-north line alongside the local meridian (wikimedia.org). Because the polarization pattern is dependant on the Sun and Moon it changes not only throughout the day but also throughout the year. When the Sun is on lower altitude above horizon, then it appears to look more redder instead of yellowish. 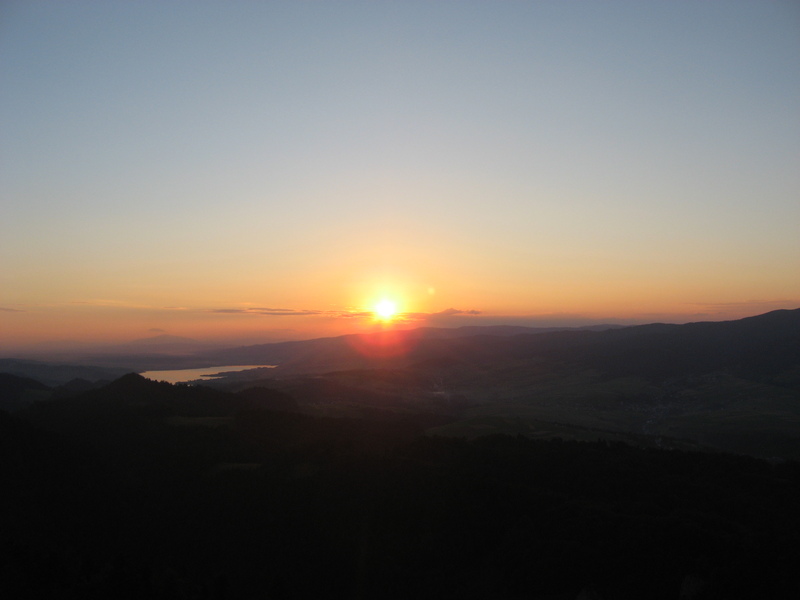 The reddening of the Sun increase when closer to horizon, because the light being received directly from it must pass a longer way through the atmosphere. When Sun is on the horizon the sunlight must pass through the greatest proportion of the atmosphere and looks the most reddish (Pic. 9). Pic. 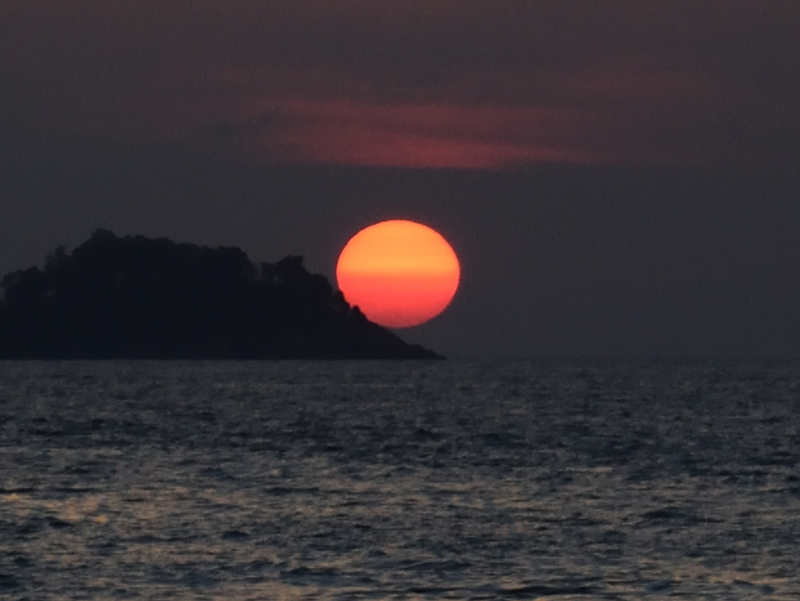 9 The Sun is the most reddish when shine on the horizon. Phuket, Thailand. It happens like this, because when solar beam must go through the longest portion of the atmosphere thus the longest wavelengths like red and orange are scattered much more than short wavelengths (like a blue). It said to be, that Sun is slightly more reddish during the set than during the rise because of different level of aerosols concentration. The long wavelengths scattering refers mainly for this part of the sky, which is the closest to the solar disk. When further from the Sun the sky appears to be more blue (Pic. 10, 11). Pic. 10 The reddish sky appears to be seen close to the solar disk only. The intensity of reddiness depend on the degree of aerosols concentration. Sky is more blue with increasing distance from the Sun. Czorsztyn, Poland. Pic. 11 Twilight sky in solar direction remains reddish near the horizon and more blue with increasing distance from the horizon towards zenith. Odrzykoń, Poland. This is because of two basic reasons. Firstly when further from the Sun you see at least a bit upper atmosphere (Pic. 12). Being around 10-20 km above the ground the solar beams has shorter way to encounter in atmosphere, hence scattering a shorter wavelengths is more significant. Secondly the ozone layer absorbs ultraviolet light (invisible for human eye very short vawelengths with frequency from 10 to 400 nm) and in the result keep the sky blue for entire twilight (Pic 12). Pic. 12 The pattern of solar beam scattering in Earth’s atmosphere throughout the day: A – during the sunrise, B – at the noon, C – around sunset. 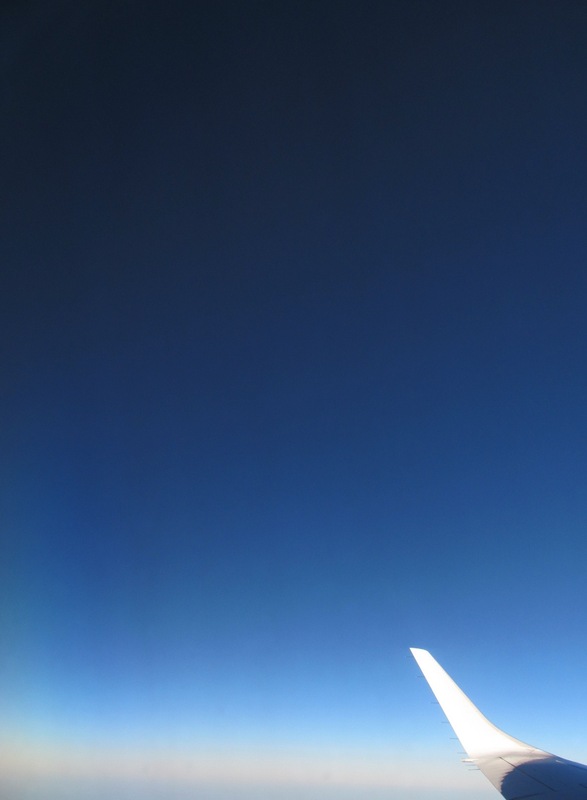 Blue line – upper troposphere, faint blue – upper Earth’s atmosphere. Observer located in B point see only short wavelengths coming through, solar disk appears to look yellowish then; Observers located both in point A and C see the reddish Sun, because the light beam passes longer way through the atmosphere (pattern 3). When take into account patterns 2 and 1 at the moment of sunrise or sunset we can understand, that solar beam passes through thiner part of the atmosphere reaching only upper troposphere (pattern 2) or only upper atmosphere (pattern 1). For pattern 2nd sky will appear yellow and reddish during the sunset, for pattern1 sky remains still blue, because the short wavelength are not absorbed in upper atmosphere conditions. Thus Sun from aircraft cruising altitude looks more orange and yellow, at the moment of sunset (Pattern 2nd) and still yellowish on upper atmosphere (Pattern 1st). Third factor lies in scattering the small particles. When closer to reddish Sun we have more front scattering so this section of sky appears more reddish than opposite one when back scattering occurs. The 3rd factor is more important in hazy conditions. 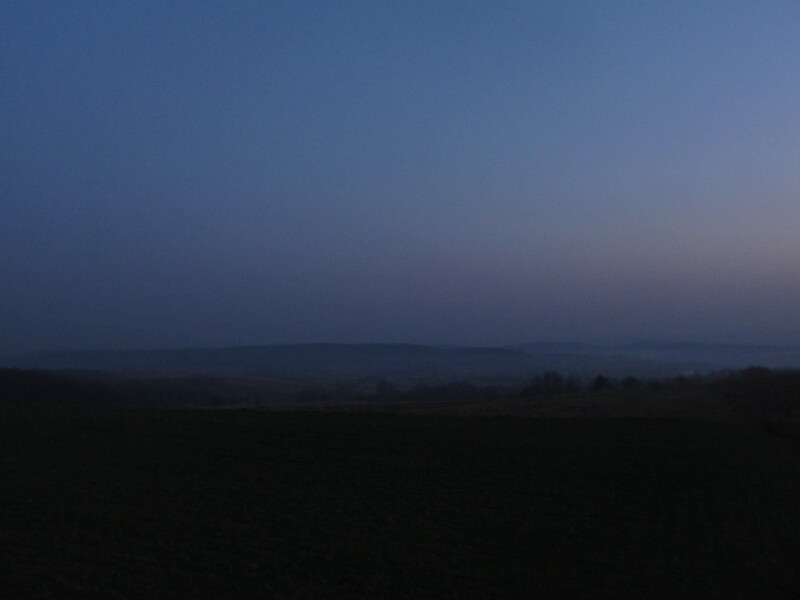 Even in near-Rayleigh conditions a zenith sky colour during the sunrise/sunset looks slightly different (Pic. 13). Whereas it’s a deep blue during the day, when evening approaches some greenish and reddish tint appears to be visible on still dark blue background (Pic. 13). It is effect both aerosols concentration, that makes sky hue different according to Mie scattering (more in the next article) and general red wavelengths involvment, especially in lower part of the atmosphere (Pic. 12). Pic. 13 The zenith sky color difference throughout the day: left – deep blue as seen throughout the day, right – deep blue mixed with greenish and a little bit reddist tint, as we can see during the morning or evening time. The reddish effect is visible sometimes on the opposite part of the sky during the sunset. The purple sky is to be seen alongside the twilight wedge in particular moment just after the sunset or before the sunrise. This is a secondary response of the long wavelengths that comes from the troposphere (this is caused by back-scattering sunlight bouncing off dust particles suspended high in the atmosphere) and it depends on the atmospheric conditions. Pic. 14 The twilight wedge (Belt of Venus) simplified pattern depends on the Sun’s altitude below the horizon, where: A – upper atmosphere, O – ozonosphere, B – solar beam. The absorption of short wavelengths has been omitted. The image shows the difference of the Belt of Venus appearance throughout the civil twilight for sunset or sunrise (S), Sun position around 1-2 degrees below the horizon (-1), 4 degrees below the horizon (-4) and at the civil twilight border (-6). When observer see the sunset (Pic. 14) arleady can see rising reddish civil wedge at the antisolar point (Pic. 15). When Sun is 1-2 degrees below the horizon (Pic. 13) the civil wedge is clearly visible as an reddish belt, that appers to be fainter as Sun plunge deeper under the horizon. The reddiness of the Belt of Venus arises out of a long way of scattered light between the sunset at the Ozonosphere layer and the observer. When Sun is around 4 degrees below the horizon (Pic. 14) then the way of single scattered light is shorter to observer, thus the belt of Venus look less reddish and includes more orange and yellow hue. Finally at the end/beginning of the civil twilight, when the civil wedge cover local meridian the way of single scattered light to observer is the shortest. 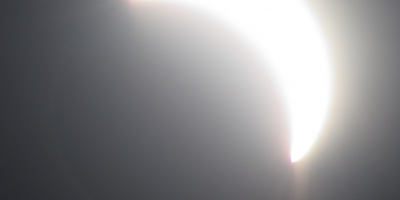 In this case the border between sunlit and shaded Earth’s atmosphere is marked only by blue hue, because again only short wavelengths are secondary scattered towards the observer. Eventually in this moment the Belt of Venus merges with the twilight sky. Pic. 15 Twilight wedge (the Belt of Venus) becoming visible at the beginning of the dusk, just after sunset in Stockholm (sheratonstockholm.com). 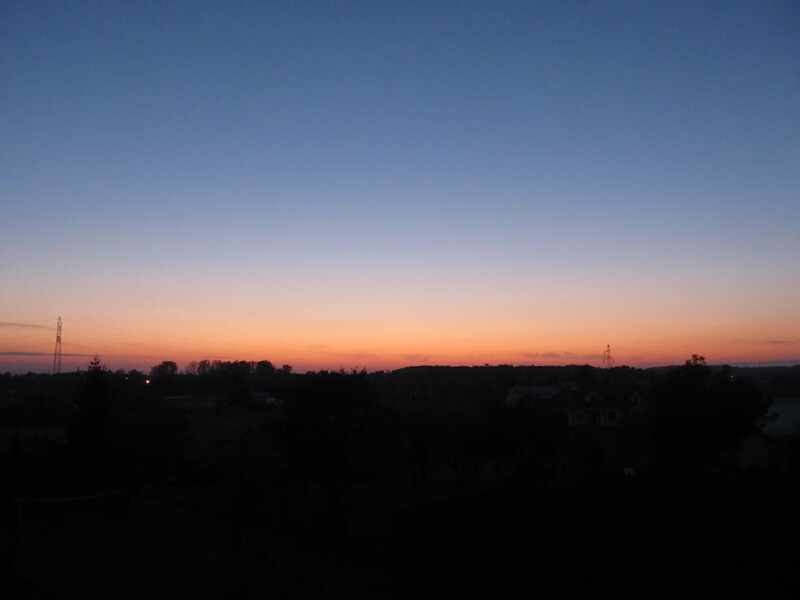 Is easy to spot the reddish belt, which stretches alongside the horizon. Pic. 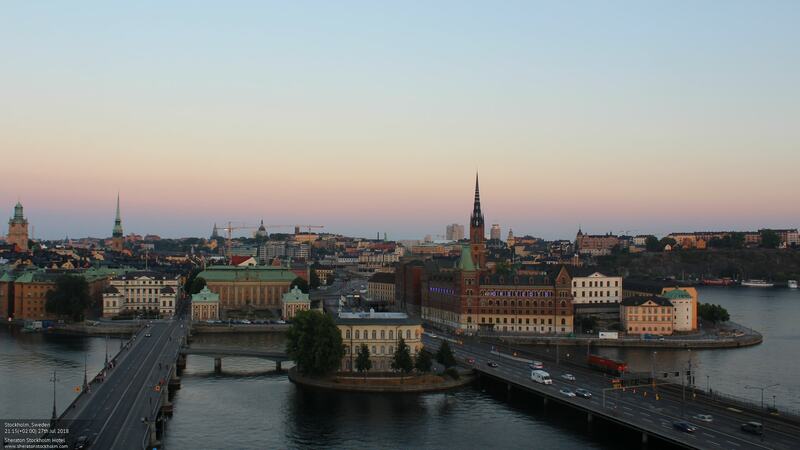 16 Twilight wedge (the Belt of Venus) visible above Stockholm when Sun is around 2 degrees below the horizon. 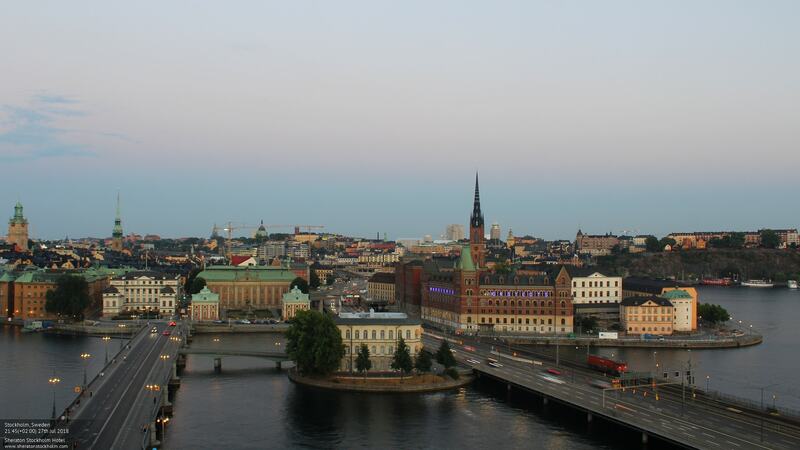 Comparing to previous picture it looks less reddish (sheratonstockholm.com). Pic. 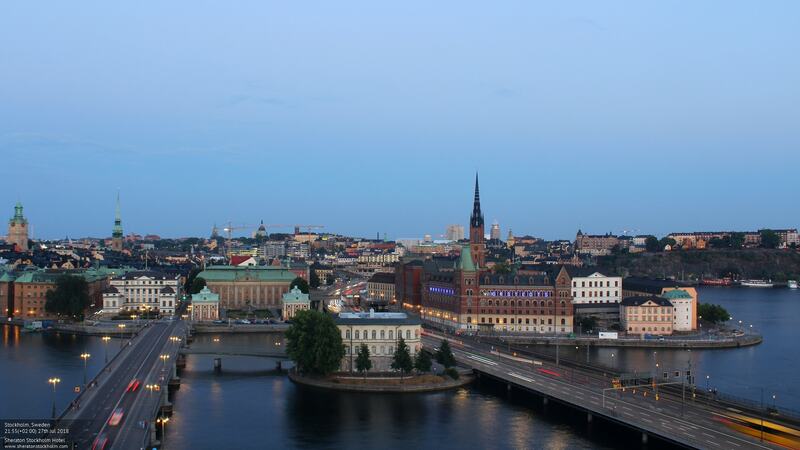 17, 18 Twilight wedge (the Belt of Venus) above Stockholm, when Sun is around 3 deg below the horizon. 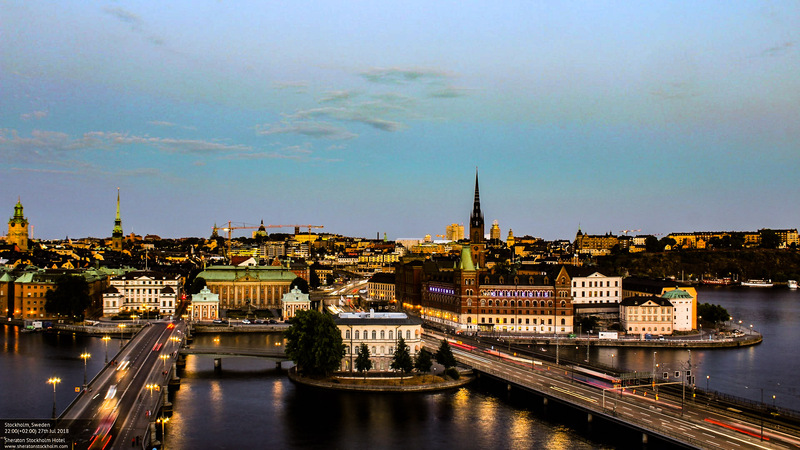 Normally it has more orange and yellow hues instead of reddish at the sunset: 16 – normal image, 17 – modified in Photoshop Exrpess (sheratonstockholm.com). Pic. 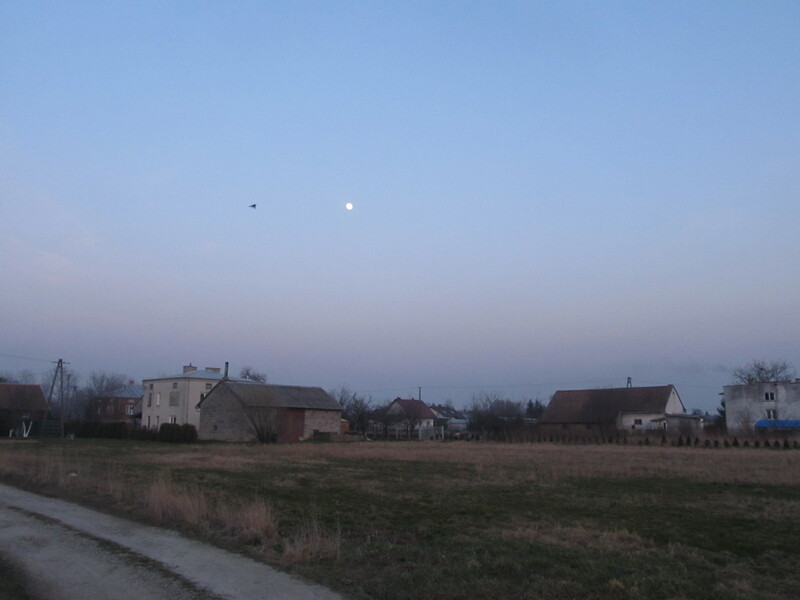 19 Twilight wedge (the Belt of Venus) seen above Długie in Poland. You can easily point a greenish-yellowish line. The colour of the Belt of Venus can depends on the aerosols concentration in the lower atmosphere also. Długie, Poland. Pic. 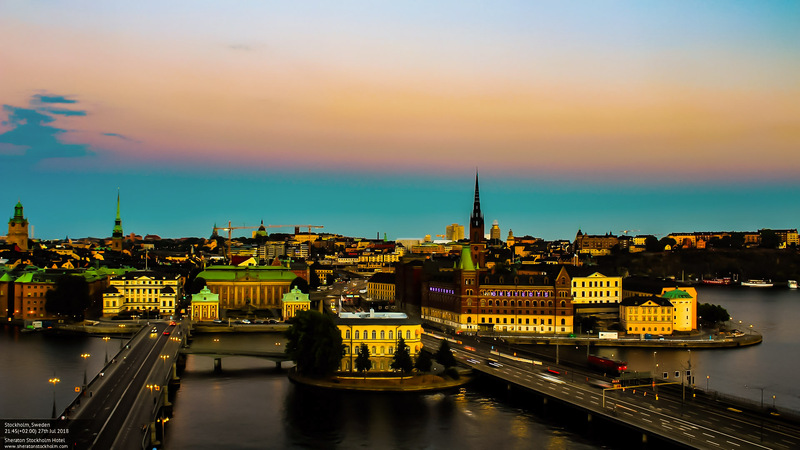 20, 21 Twilight wedge (the Belt of Venus) seen above Stockholm when Sun was around 4 deg below the horizon. A faint orange hue, making sky greenish is visible on emphasized image. 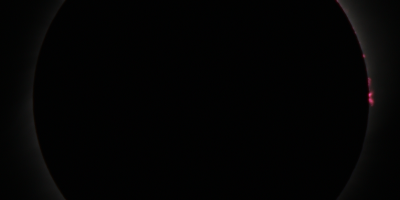 Just below an Earth’s shadow is visible as an dark bluish area of sky: 19 – normal image, 20 – modified in Photoshop Express (sheratonstockholm.com). Pic. 22 When the civil dusk end or civil dawn begin, then the twilight wedge (the Belt of Venus) fades out on around 90 deg from the Sun’s location. Podniebyle, Poland; view towards SSE. This is caused by long wavelengths scattering in stratosphere and also long distance to observer, that this reflected and scattered light have to encounter through the atmosphere. As twilight proceeds the twilight wedge rises up and the purple sky effect dissapear (Pic. 15 – 22). Next a whole belt of Venus merges in the twilight sky (Pic. 22). Beside of the belt of Venus we can see the Earth’s shadow (Pic. 20, 21), that looks blue. This is because the upper atmosphere is the only part of the atmosphere that remains sunlit above the eastern horizon after sunset. Thus the sunlight hitting the upper atmosphere is Rayleigh scattered. Similarly in case of late twilight when nearly whole sky plunge in the Earth’s shadow the sky remains bluish until total darkness due to Rayleigh secondary scattering, when you are looking in anti-solar direction. Kondratyev K. YA, 1969, 6 diffuse radiation of the atmosphere, (in:) International Geophysics, vol. 12, p. 363 – 410. Why the sky is blue instead of purple? Why the sky is not purple? Why the sky is never green? Why the sky is not violet? Why is Earth’s shadow blue? 1. What is the colour of martian sky?